When Entrepreneur Middle East was launched two years ago, one of the foundational principles that we laid out for ourselves as a publication was that we needed to be more than a mere spectator of what’s happening in the region’s business arena- our mandate was to be active participants of the entrepreneurial ecosystem here, cheering, supporting and enabling the men and women trying to make a definite impact in the MENA region through their professional endeavors. Now, I’ll be the first to admit that having such a directive hanging over our heads has been a daunting affair for those of us working under this banner. Our desire to be different from the status quo meant that we had to be inventive in how we went about doing things- we became purposely choosey about what we feature as content; we made it a point to be at as many ecosystem events as we can (this is why you often see us working over weekends, so as to catch up with time we lost over the week! ), and we were keen on using our platform to throw the spotlight on not just the business people who had “made it,” but also the fledgling new enterprises that showed the potential to actually effect change in the region. It is thus this particular foundational value that is governing our newest initiative at Entrepreneur Middle East: a contest that will see us give away US$25,000 each to two deserving startups operating in the Middle East. Keep an eye out for #EntMEStartups on our social media channels; that’s the hashtag we will be using to refer to this contest over all our platforms. 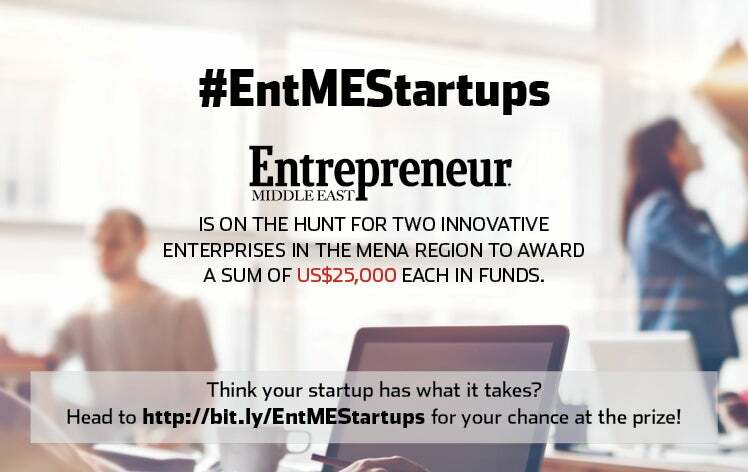 Entrepreneur Middle East is on the hunt for two innovative enterprises in the MENA region to award a sum of US$25,000 each in funds. Think your startup has what it takes? Apply to the #EntMEStartups challenge here before November 15, 2016 for a chance at the prize.